For this year’s CPC Report, I’m going to do a series of reports, and this first one will feature some of the COOL DUDES of CPC! And of course, it is not an exclusive list! (Sorry if you got left off!) Next will be the GROOVY GIRLS of CPC and I’m sure it will be easier on the eyes, but I’ll start with the guys since their my best buds! 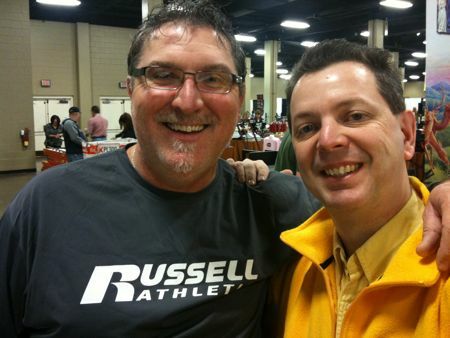 One of the neatest things about CPC is the friends you make over the years as we minister together! 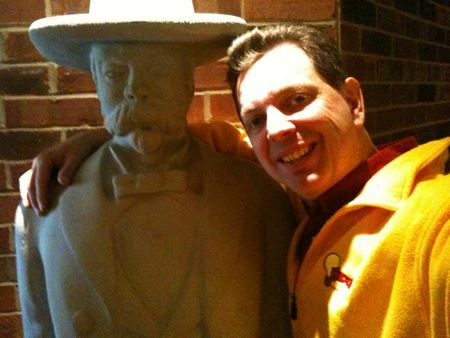 Me and Jack Daniels. OK, we are exactly buds, but he was the only guy around the night I arrived, so we hung out the first night while I worked on my lap top to get some last minute work done for my workshops. I promise I only had root beer! Byron Ragains from David C. Cook was the first friendly face I ran into. 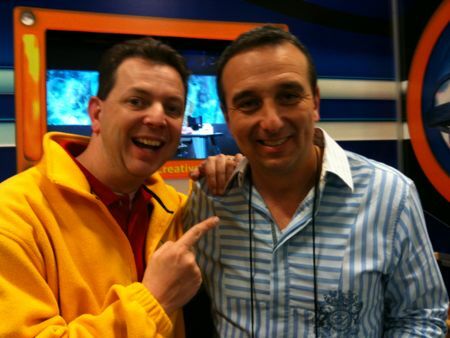 I’ve known this CM Dude since I was a green thumb back at Moody Memorial Church in Chicago back in the early 90’s. Byron is enthusiasm on steroids and a constant encourager of everyone he meets. But of course he is – he roots for the Cubs, he is well trained in rooting even for losers! How much easier to cheer on CM folks!! All kidding aside, I always tell people Byron is one of those people you meet him once and you feel like you’ve been his friend forever. Greg Baird has been the chidren’s pastor for some household name senior pastors – but that isn’t what makes him so appreciated – it is his humble desire to help everyone who crosses his path. I’ve been lucky enough to have him as a trainer for Kidology and even luckier to have sat under his training when I was starting out. 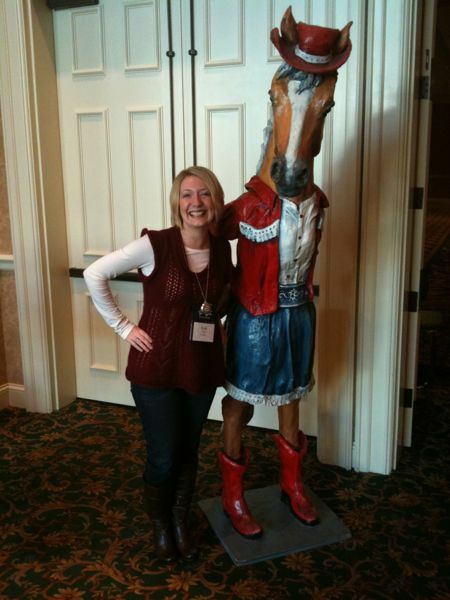 He has most recently joined the staff at Kidz at Heart. 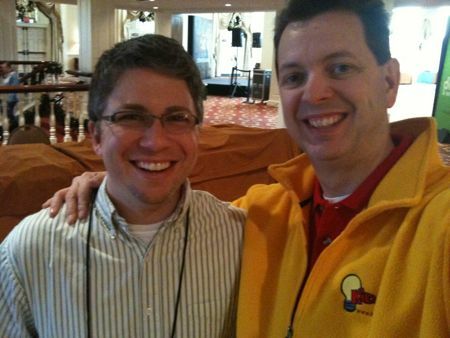 It was great to finally meet Andy Johnson of Free CM Stuff.com in person! 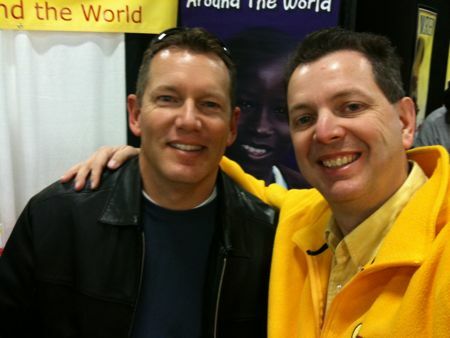 Here’s a guy who shares my heart for equipping and encouraging others in children’s ministry and spends hours a week finding ways to resource and help others to prove it! 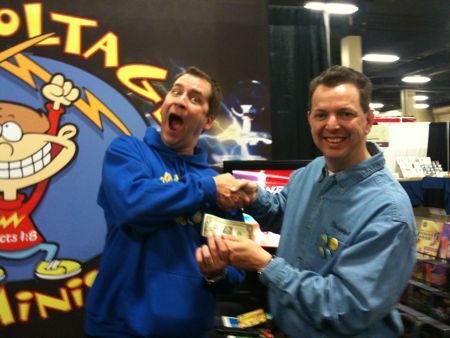 Brian Dollar is the man behind High Voltage . I’ve not only only teased him about his name on my blog , on twitter, and on my podcast but at CPC every time I saw him, I offered him a dollar so I could say “I was giving Brian Dollar a dollar.” Well, he finally took my dollar and that brought an end to that!” He’s a great guy, though, and he produces some amazing CM resources all available on Kidology.org and the price won’t shock you! Few know that Dale VonSeggen, founder of One Way Street, played a major role in starting CPC back in the early 80’s – but is such a humble guy he’d never tell you that himself. 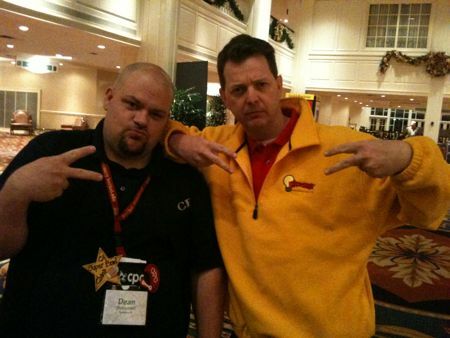 He’s just one of those guys who makes things happen for the Kingdom in children’s ministry with no regard for the spotlight, which is why he is one of my heroes. Pay no attention to that red character over my shoulder! But the guy next to him, is Todd Liebenow, the new president of One Way Street, who went from employee to owner a few years ago. Now he’s got his hands in the business, so to speak. 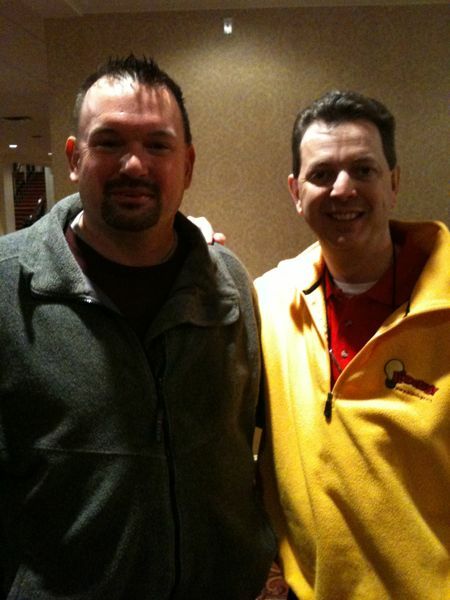 I met Chad Miller when I was speaking at the Cove for the Billy Graham School of Evangelism a few years ago. Chad was assigned to me as my “ambassador.” Basically, just to help me with whatever I needed, and boy did I need it, since I came with a foot injury having just fallen off a boat on Labor Day and was hobbling around with a Moses-like staff hardly able to walk! 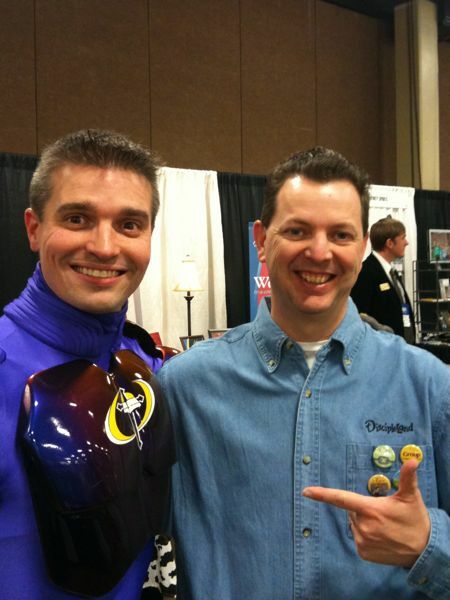 If you ever meet Chad, you HAVE to ask to hear his Billy Graham impersonation – it is SPOT ON! 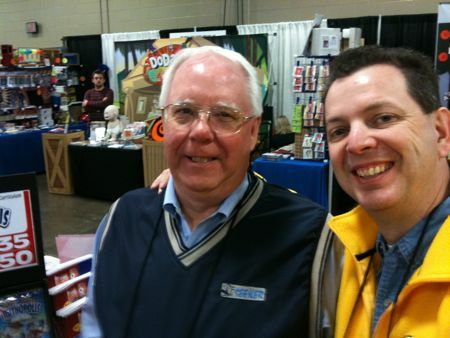 Roger Fields, of Kidz Blitz, holds a special place in my CPC memories – as he was my FIRST CPC workshop presenter I heard when I was a first time attender! He radically challenged my thinking and to this day many of my radical ideas in children’s ministry came from this cool dude! (Like not accepting any volunteers – “we’ll approach you”) We’ve had him at our Kidology conferences and love him because this guy is always rockin’the boat in children’s ministry – literally! I’ve since been on his Children’s Ministry Conference Cruise, and next July Kidology will be at his Children’s Ministry Expo! Will you? And who doesn’t know Mike? The man who has “Elevated” children’s church for countless churches? 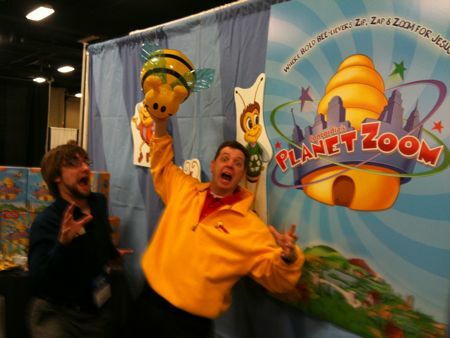 And rumor has it, he has the coolest office in children’s ministry – though I’ve not seen a picture myself, I just heard that via Twitter. I’d like to have one e-mailed to me! 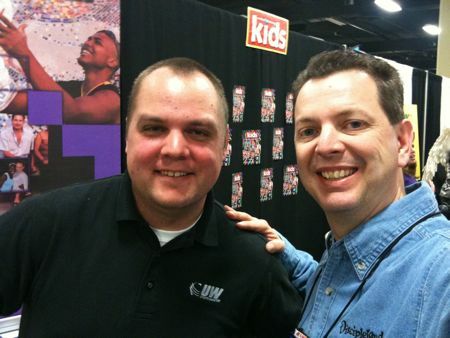 Mike is from Fellowship Church and has raised the bar for children’s church curriculum across the board. 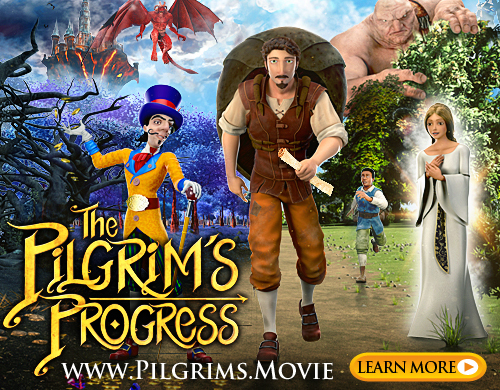 Gone is cheesy children’s church curriculum. 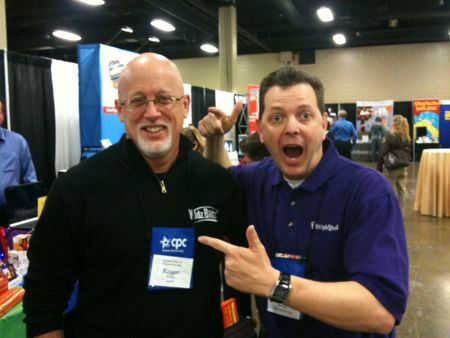 I credit Mike with challenging every curriculum creator everywhere (including me!) to step it up a notch! 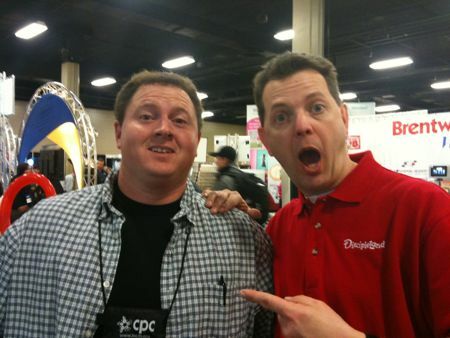 Nate is one of my CPC buds I met on the Disney World shuttle a few years ago. He confessed to being a Kidology Forum “lurker” so I called him out and finally got him to post. Now he’s well over 100 posts and a good friend! I’ve known Ryan Frank longer than most of you reading this. 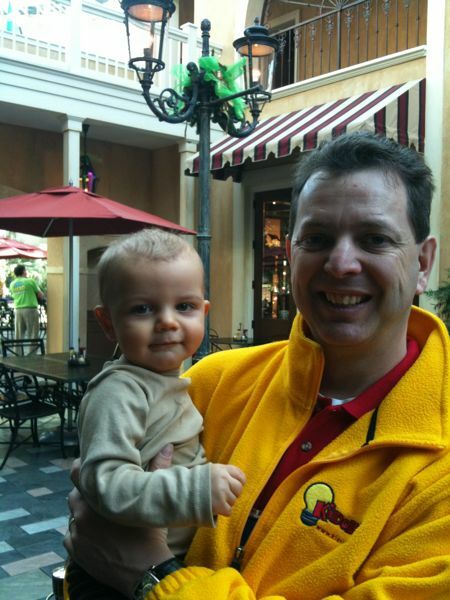 In fact, he was helping me on Kidology long before Kidz Matter or K! Magazine, so I feel a bit of pride seeing all the awesome stuff he is up to today. 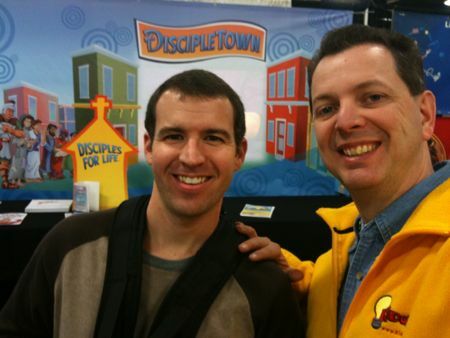 Ryan was my right hand man at Kidology at one time before God called him to launch his own ministry, and you can still see his name on posts all over my site. 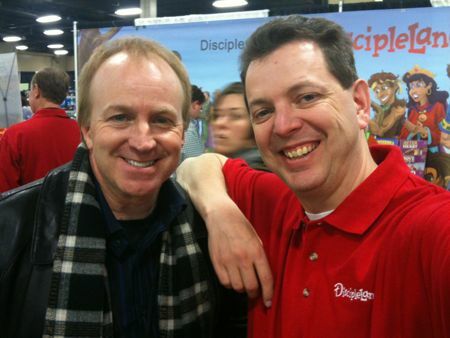 He’s an awesome networker and collaborator in children’s ministry – I have no idea how he does it all, but I’m impressed! 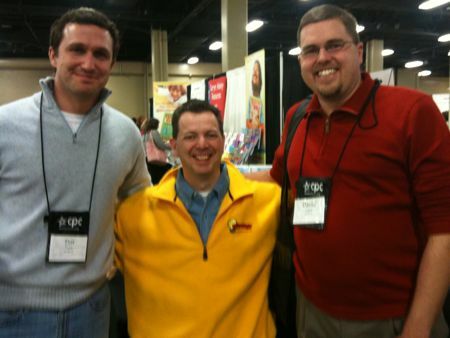 Here I am with a couple of giants of children’s ministry! 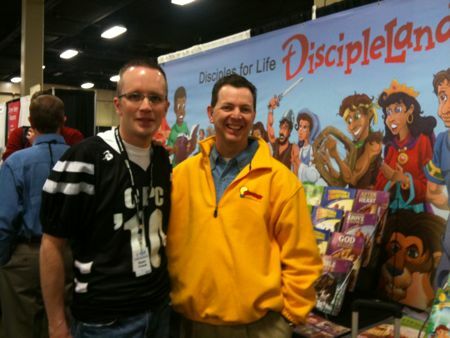 It was fun to meet the different folks who would drop by to say hello and hear the different ways that they have appreciated either Kidology.org or DiscipleTown. I deal with e-mails and forum IDs all year long, and it is so nice at CPC to finally get to put some faces to those electronic identities! I was so glad to learn that Hester Drew from UW Sports Ministry lives in Colorado, which means that I no longer will have to wait until CPCs to hang out with this cool dude! If you are looking for a sports ministry that comes to your church and does all the work for you (well, most of it anyway) you NEED to check them out! I used them in my last ministry and they were fantastic! This is the only dude I don’t know personally, but hey, you gotta pose with Bible Man! If you haven’t seen my Ronnie Video on YouTube, what are you waiting for? 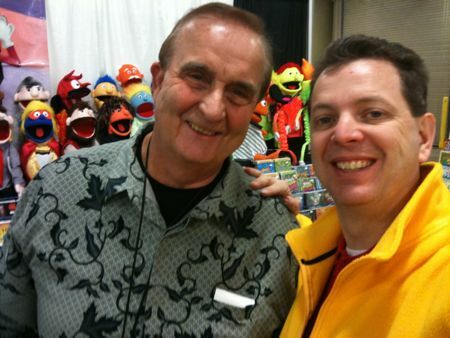 Ronnie’s been a staple of children’s ministry for years, but that doesn’t mean he isn’t still cutting edge! I love his music and his heart for reaching kids. During some tough times in life, he has been a good friend I’ve been able to call on. And that’s worth a million bucks. 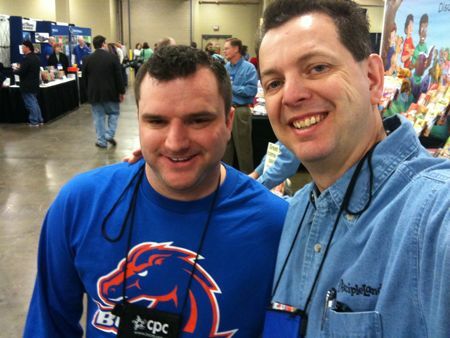 Another Tweeter I got to get to know in person both at CPC and later at the airport was Dean Butterfield. I tweeted several “guess who” tweets, and he won by guessing the most correctly! 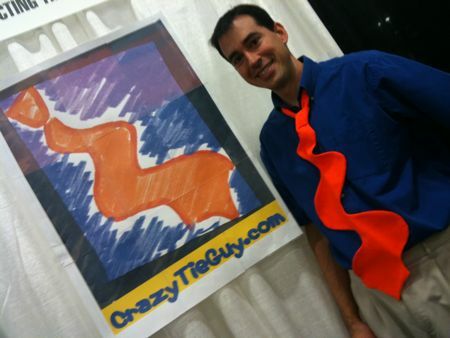 Greg Sanford is not only a regular CPCer and Kidology groupie, but I learned at our gathering, has a rather unique claim to Kidology fame… he is the mysterious “Hose Head” in this Kidology Post. Though, he doesn’t even know who submitted the picture, since he didn’t submit the game! Before the Kidology Gathering, I met this boy (and his mom). He told me that when he grows up he wants to be either a pastor or a zoo keeper. 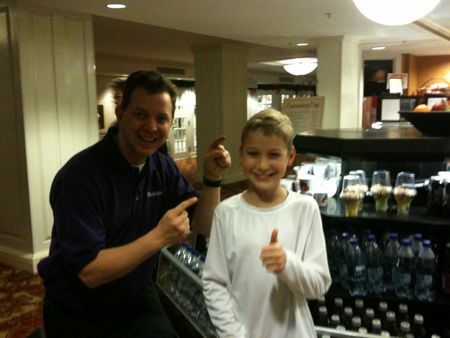 I informed him that if he becomes a children’s pastor, then he automatically is both! Since his last name is “Best” I also let him know, that he will be the Best children’s pastor! Last, but not least, my favorite Cool Dude of CPC, had to be Caden Laflin! It has hard not to just bring him home with me! Luke could use a little brother after all. NEXT: Groovy Girls of CPC! You are DA MAN… er, da DUDE! well, they all are! Enjoy the photos since i was not able to be there myself this time. Keep em coming if you have more. Leroy hit the nail on the head. I appreciate you, Karl, for how you build others up while lifting Jesus up.